Halloween wouldn’t be complete without fake blood and pumpkins, and it seems we’re catching up with our American friends in how early these goodies begin to appear. It’s a fun holiday that everyone can get involved in – and who doesn’t enjoy dressing up? Or even better, if you have kids, eating their sweets after a long night of trick or treating! In honour of All Hallows’ Eve we’ve chosen three of our favourites kids’ styles of the moment – because your little darlings monsters, need to stay dry, cosy and of course, look the part. Well they follow in your footsteps, so to speak, and we know you’ve got both excellent taste and a penchant for shoes. Remember how much fun splashing in puddles was? There are endless hours of fun to be had, right? 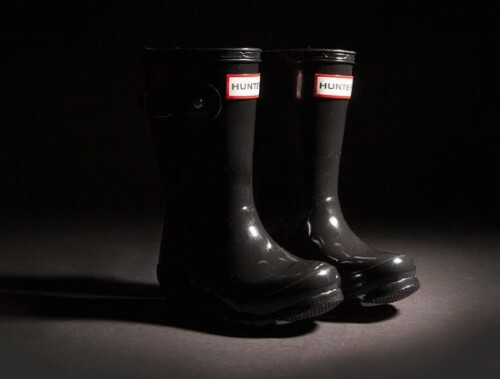 Now your little darlings can splash in style in the new Hunter Original Gloss wellies. The black unisex style is available in toddler, junior and youth sizes and will help keep their feet cosy and dry. These would also lend themselves to a creepy witch, scary spider or other terrifying costume ideas. Trick or treating is hardwork you know, and weary little feet need to get warmed up as quickly as possible after finishing to let the candy counting commence. Homeys slippers are great for keeping their little feet warm and the rubber sole provides a good grip for all the running around you know they’ll be doing, especially until that sugar high wears off. Good luck with that, by the way. The Chuck Taylor All Star Rubber is like a Converse welly boot. This everyday classic is coated with a fine water resistant rubber to keep the rain out, and a cosy fleecy lining to keep the warmth in. A great alternative to wellies when they feel like wearing trainers (or think they’re too cool for wellies), but one that will still help them stay dry. Please note: that’s not a real severed hand. It’s a fake, but we got you for a second, didn’t we? Mwah ha ha…!